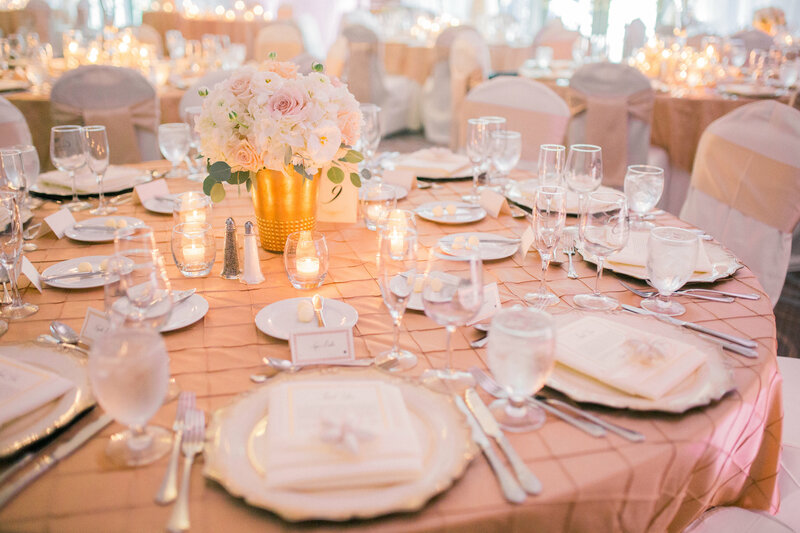 Pink and Gold Glitter go together like Grande Gold Votives and Gold Manzaniti Trees! 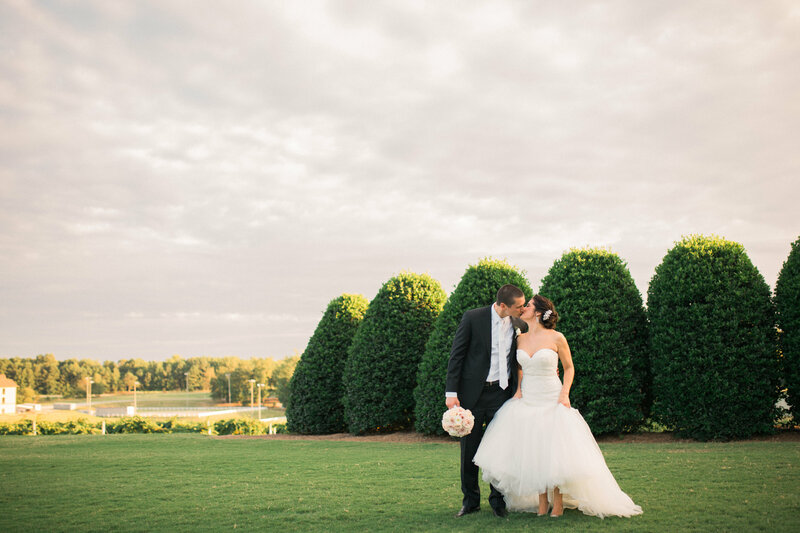 A Designer’s Dream to work with this beautiful couple – McKenzie and Steven. 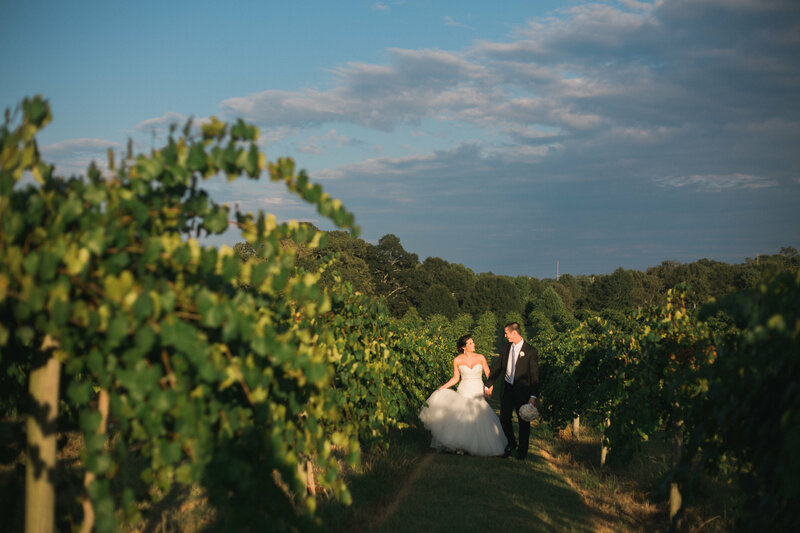 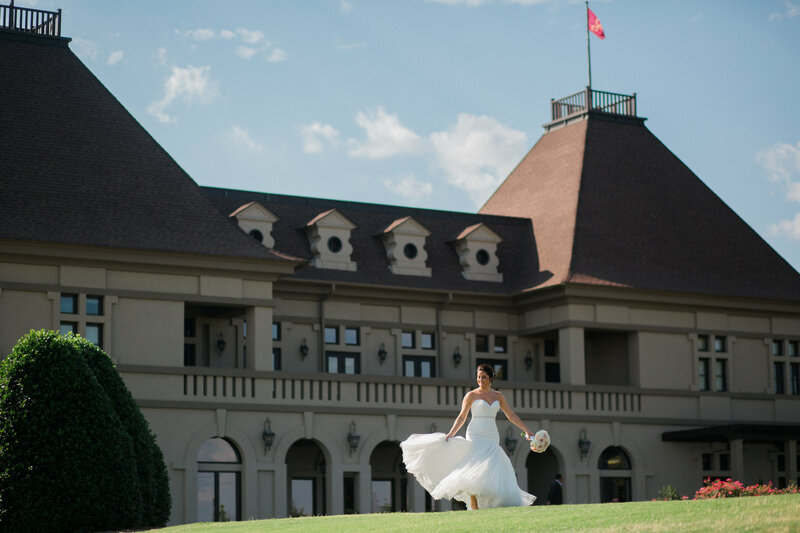 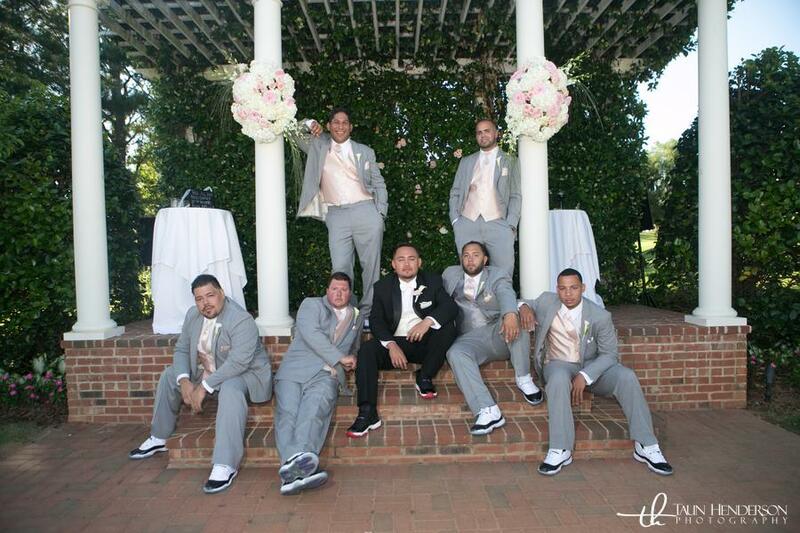 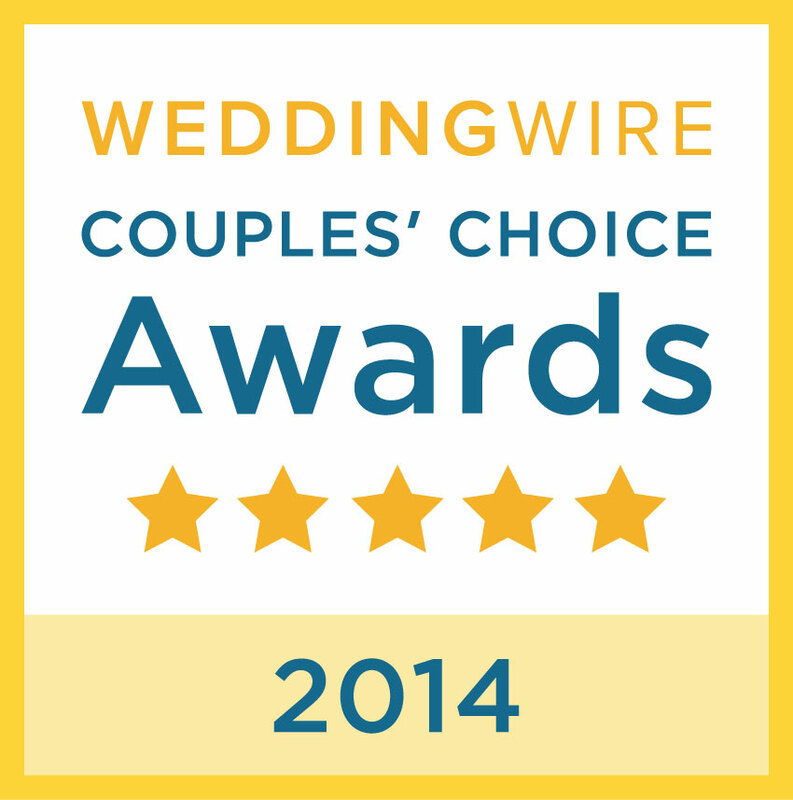 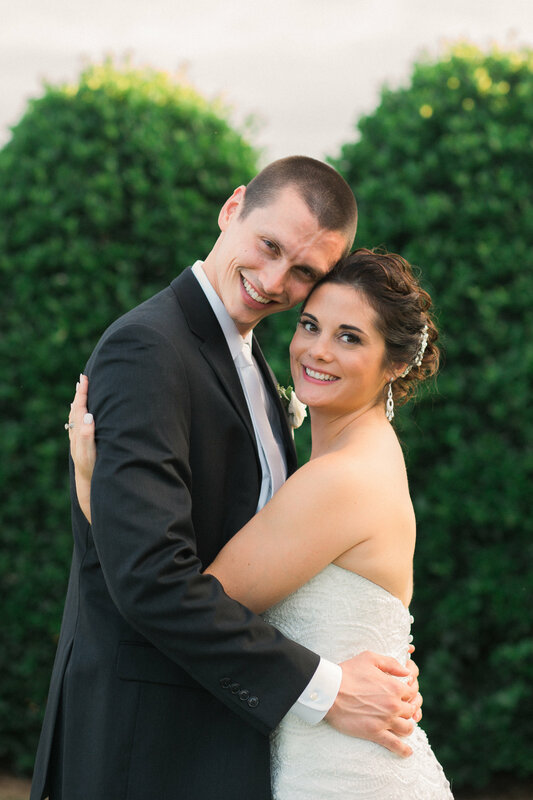 They were married at Chateau Elan Winery and Resort with their reception held at the Chateau Elan Paris Ballroom. 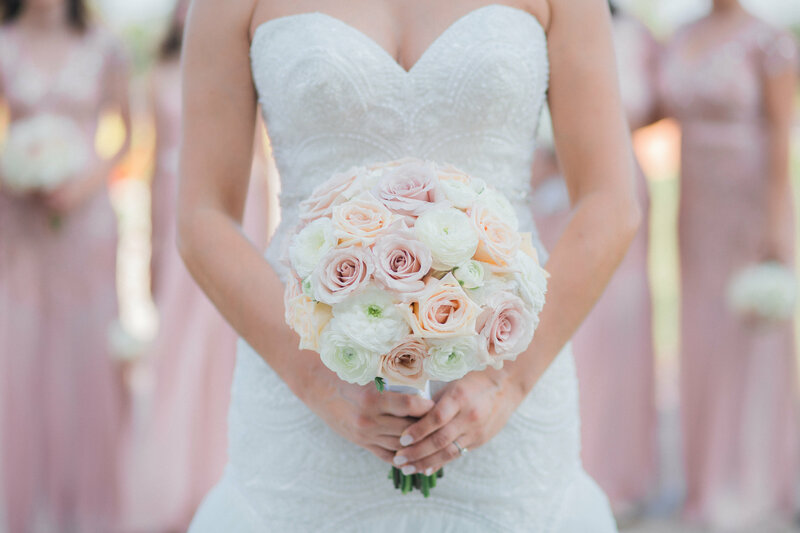 McKenzie’s Bouquet – A full, round, elegant bouquet designed with 3 white hydrangeas, 8 pink garden roses, 8 vendela roses, 8 ivory spray roses, 8 pink ranunculus, 8 light pink lisianthus, 8 pink mini callas, and a touch of seeded eucalyptus partially wrapped in white ribbon adorned with rhinestones. 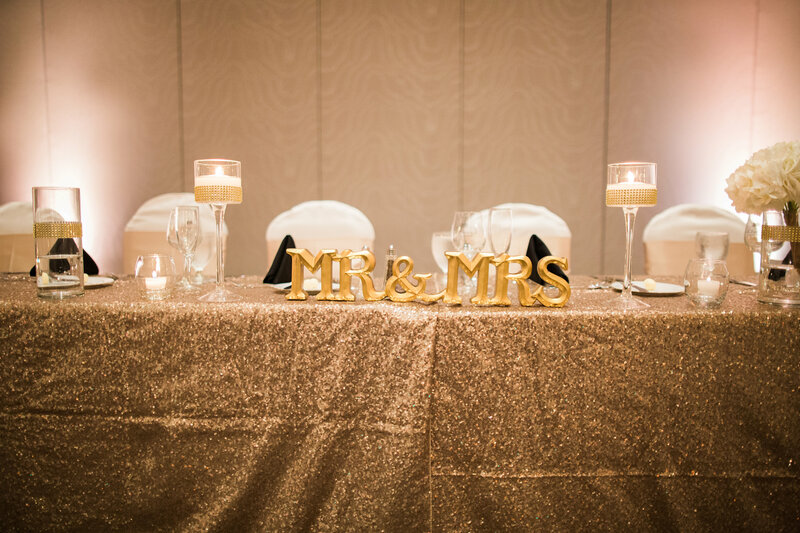 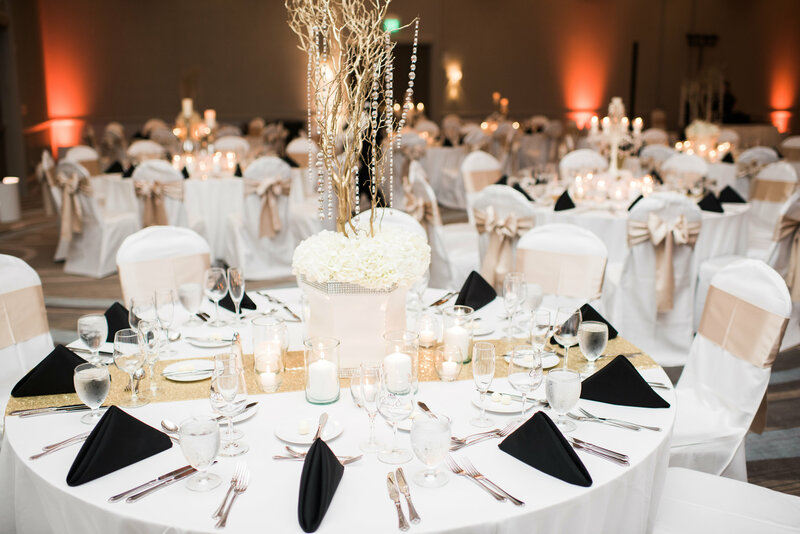 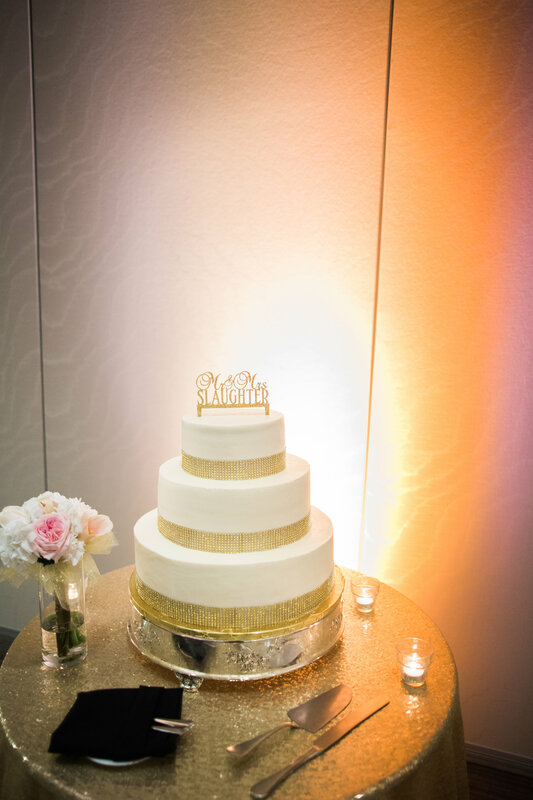 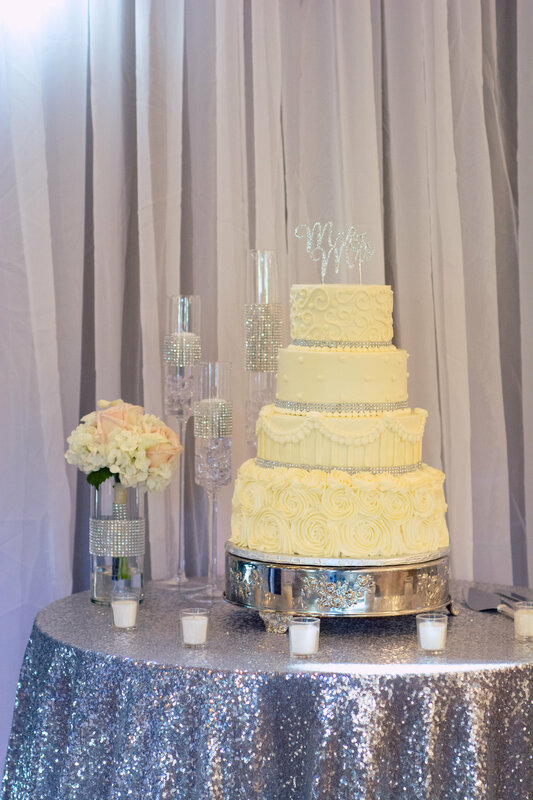 Head on over to our golden glitter style reception and see the glamour! 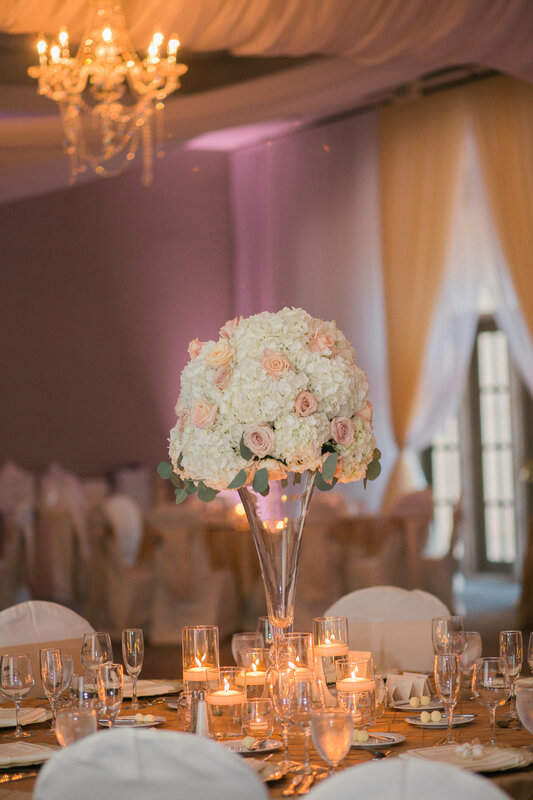 In keeping with this elegant style we added a trio of mercury candle holders, and more pillar candles surrounded by blush pink hydrangeas. 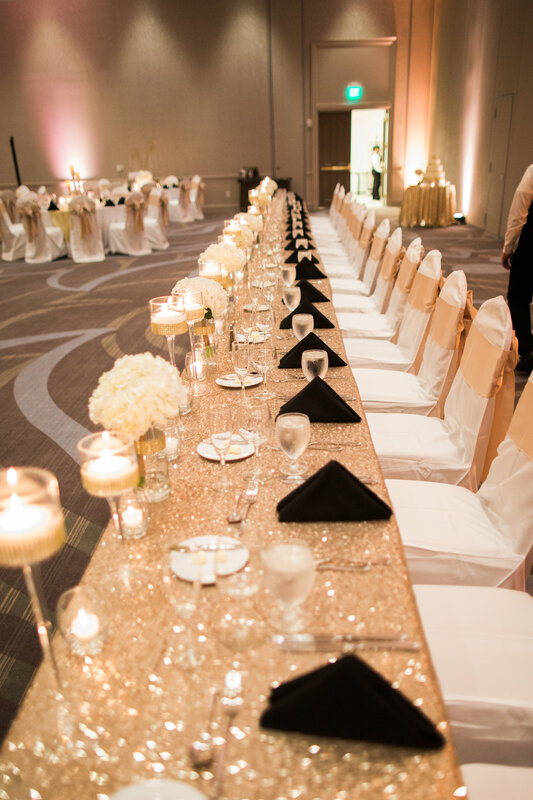 The Head table was stunning with Golden Glitz Linen. 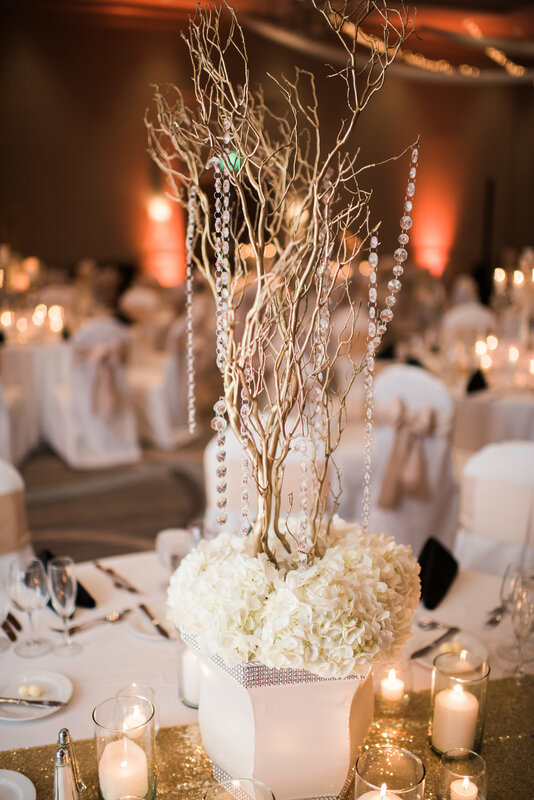 We also created a large gold Manzaniti tree placed in a white bling container with a bed of white hydrangeas. 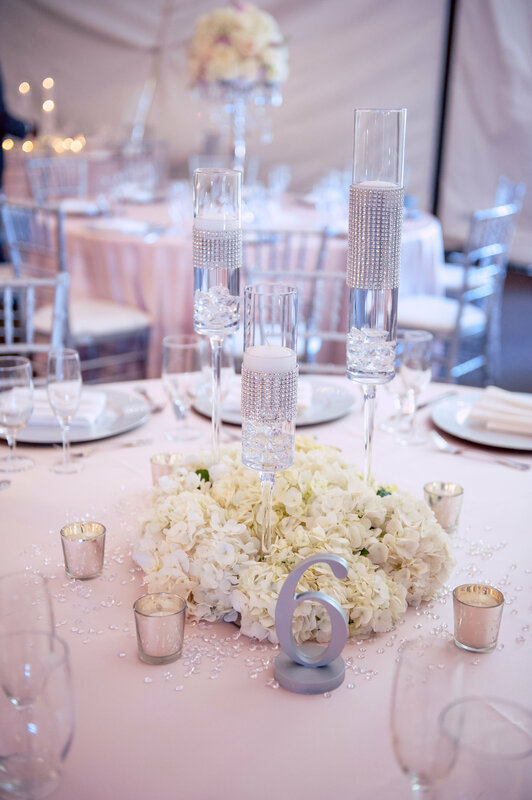 An abundance of crystals were hung on the branches and 6 grande votives and cylinder vases were around the base. 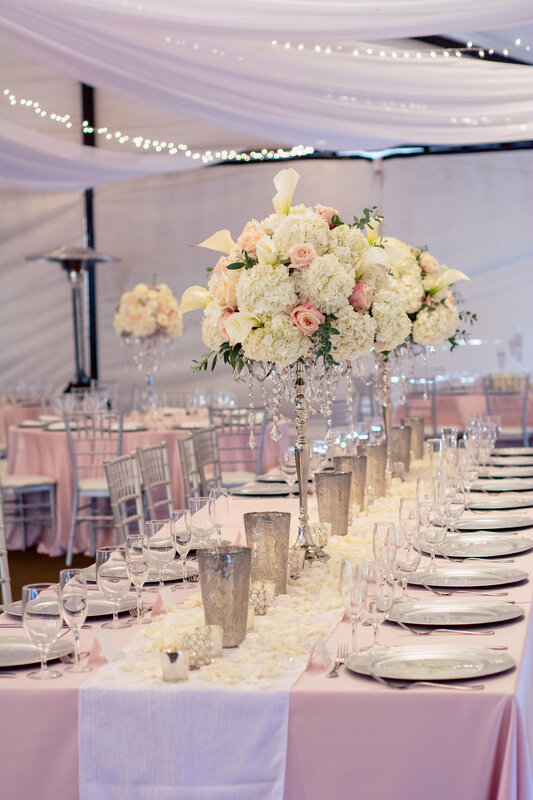 White table top Elegant candelabras with a bed of blush pink hydrangeas were also another one of our designs! 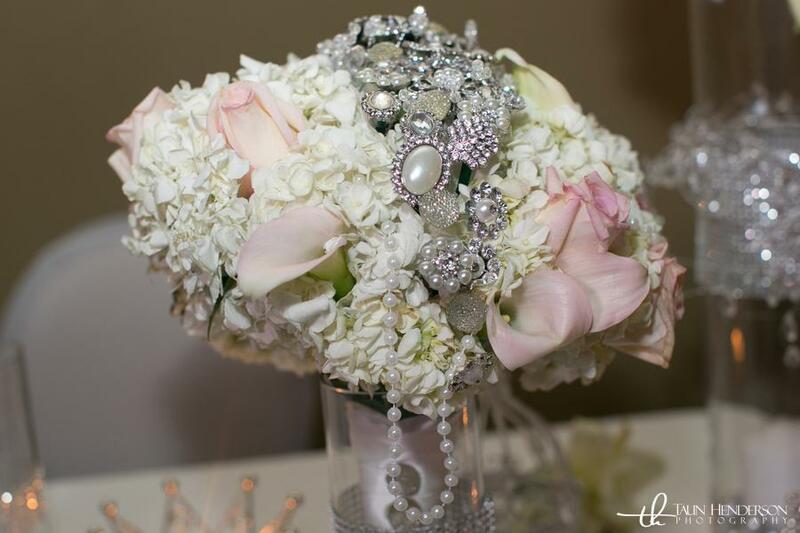 Thank you to A Creative Pear Photography for these beautiful photos. 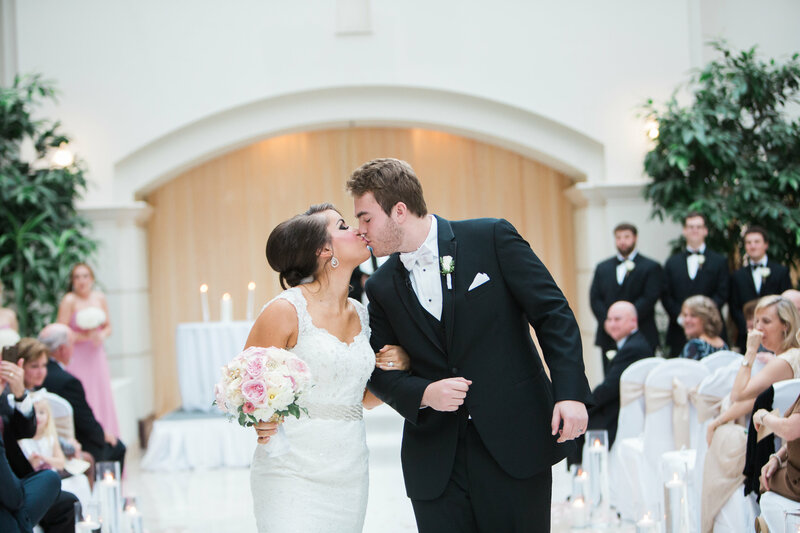 Congratulations to McKenzie and Steven! 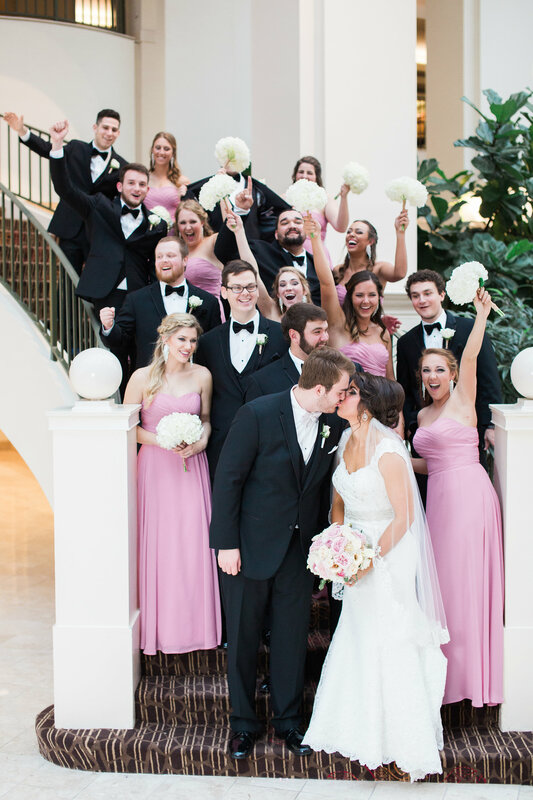 Vanessa and Alan were married at the incredible Georgia Club. 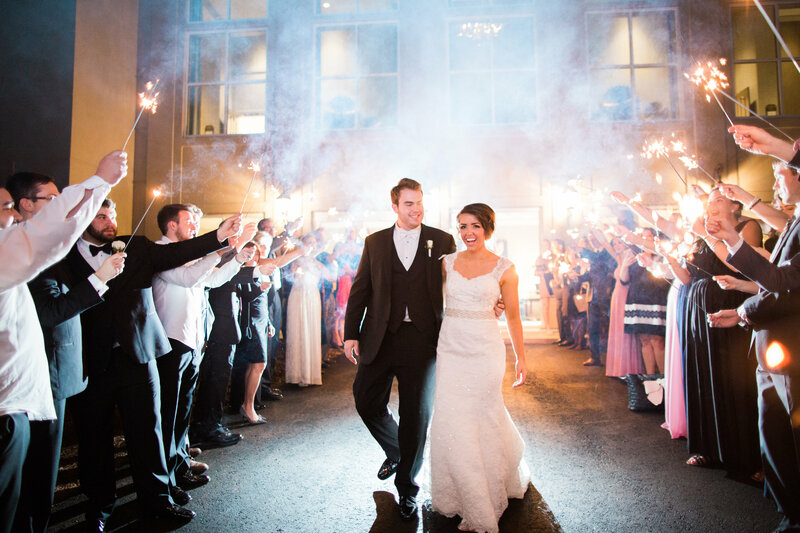 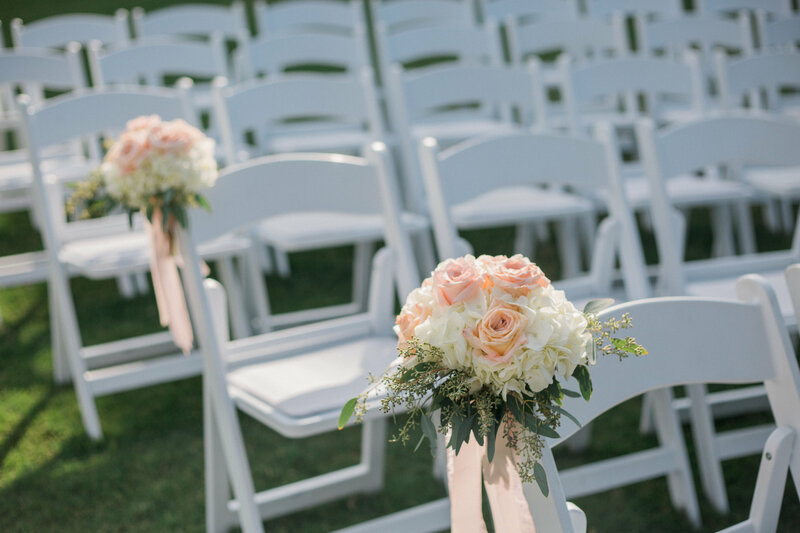 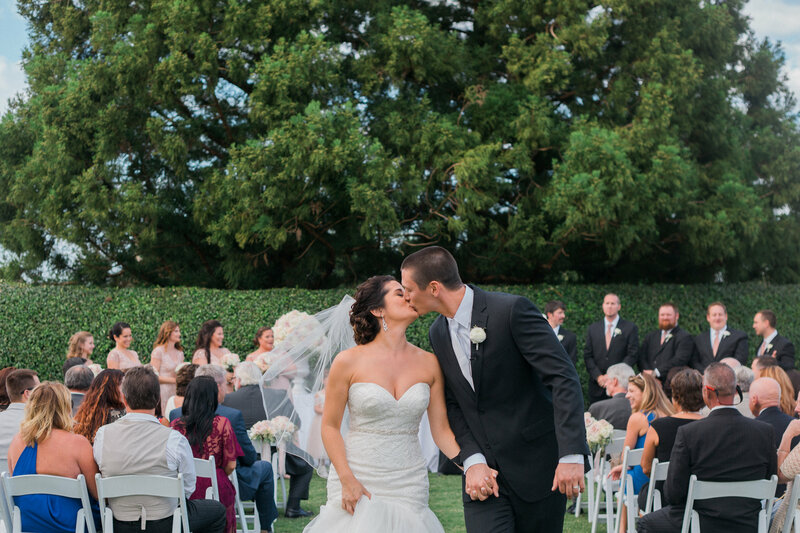 This elegant ceremony was held outdoors with picture perfect weather! 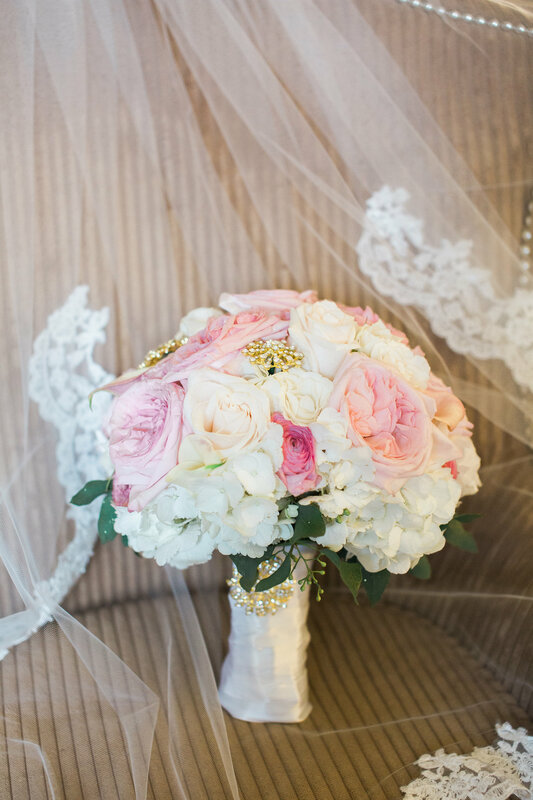 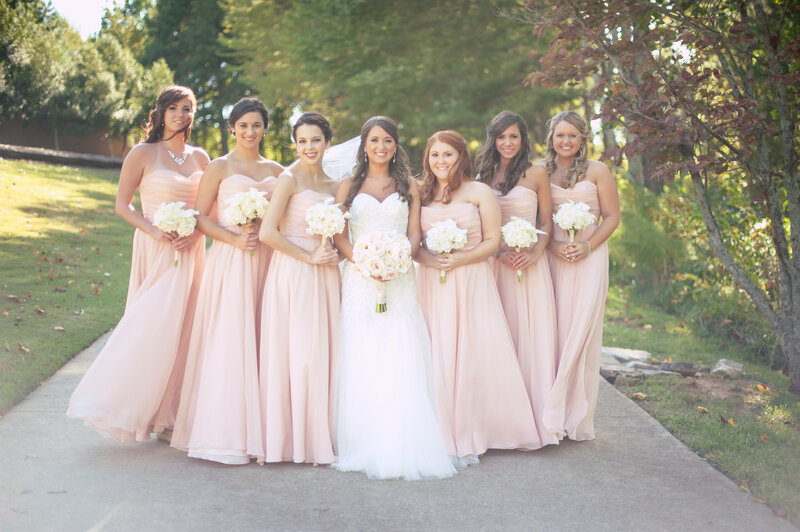 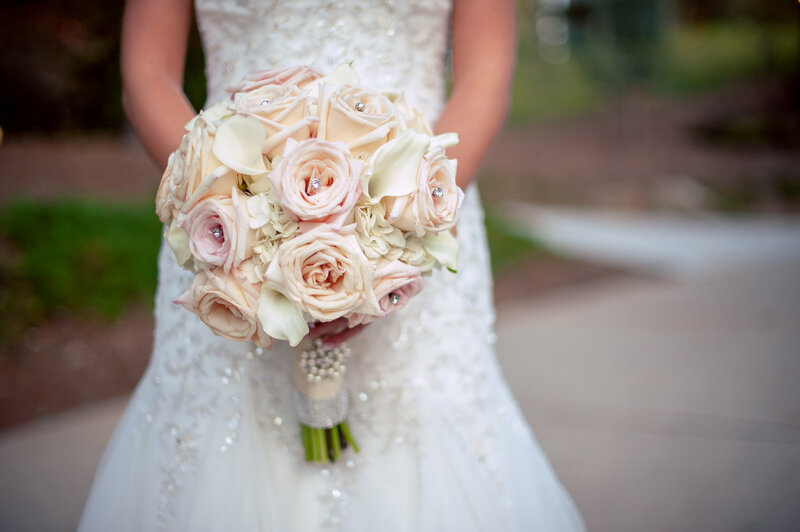 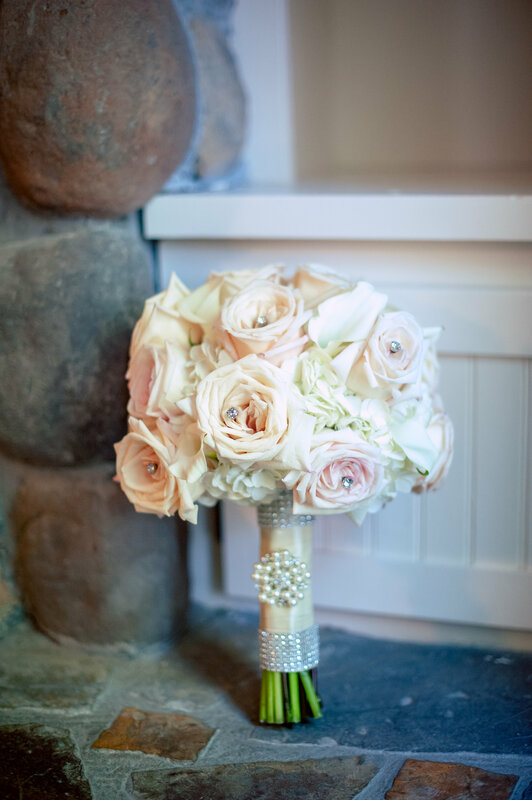 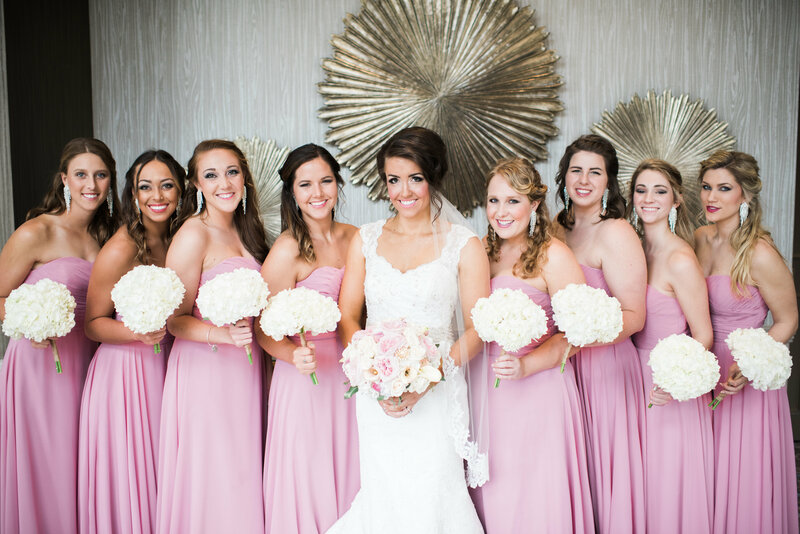 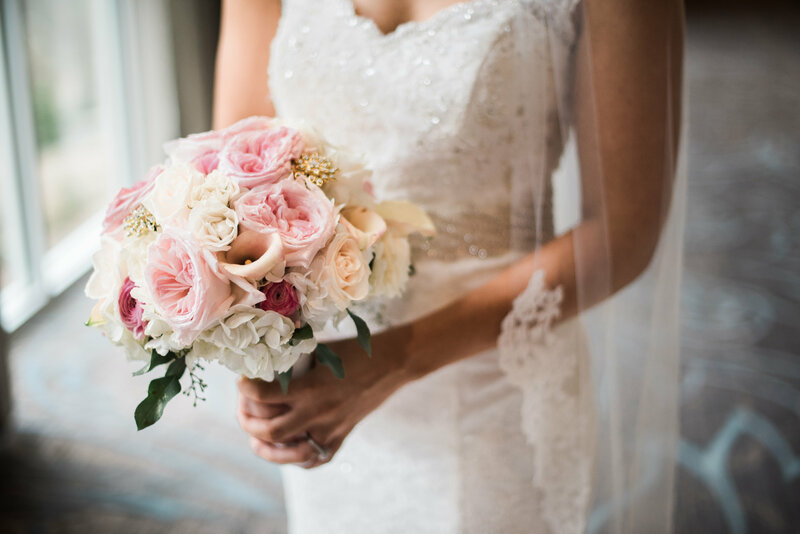 Vanessa was a radiant Cinderella – – as you can see with her blush pink, pearl, and rhinestone bling bouquet filled with ivory hydrangeas, blush anna roses, and mini calla lilies. 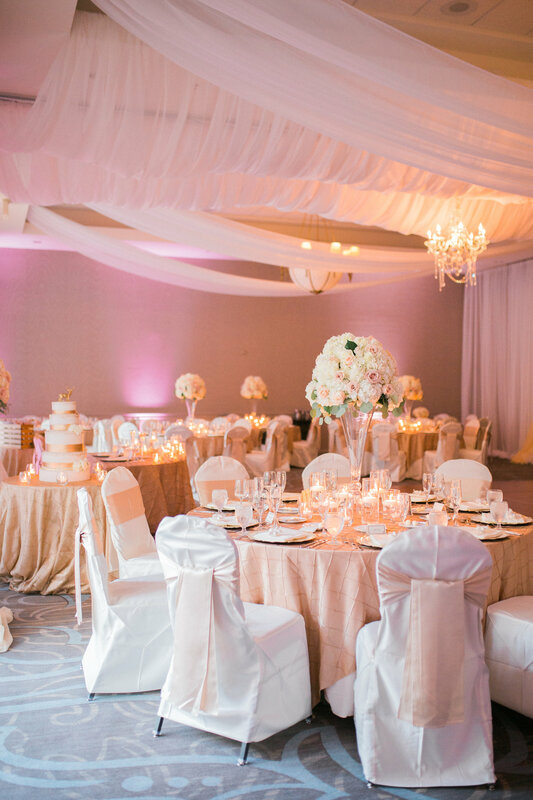 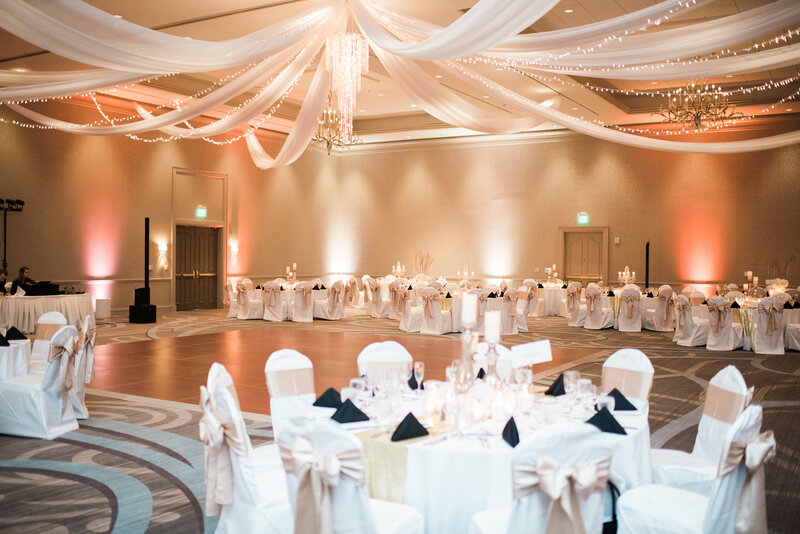 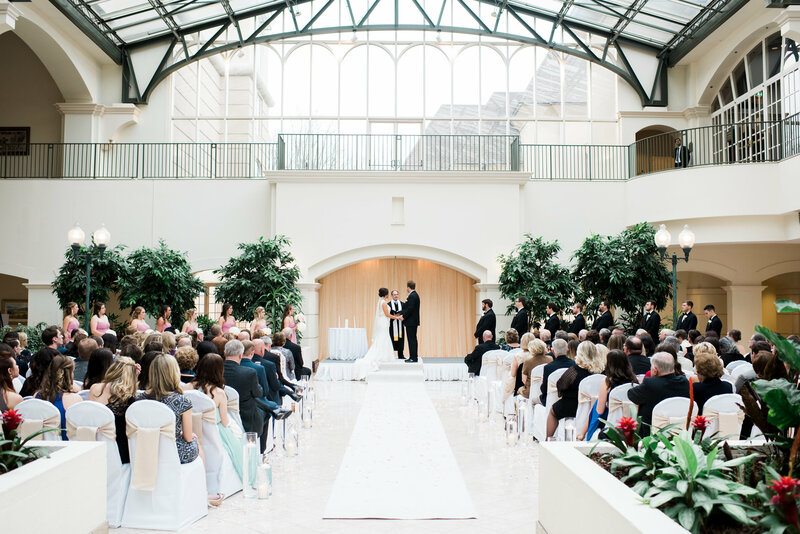 Head over to the Georgia Club Grand Ballroom where romantic elegance surrounded the reception celebration. 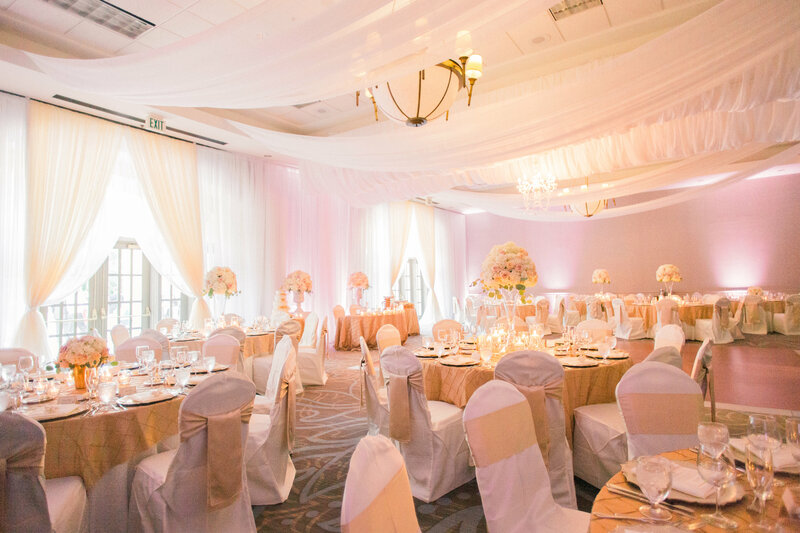 Hanging crystals, Manzanita tree, and floating candles strikingly filled the room surrounded by additional bling decor. 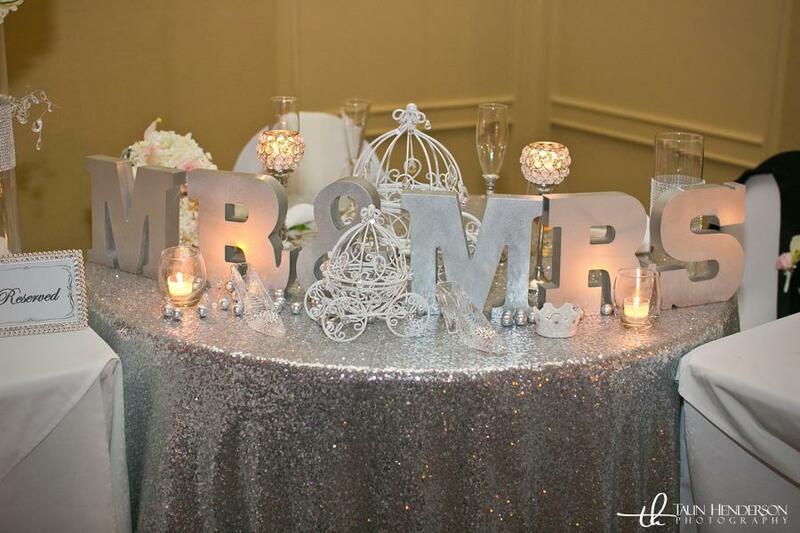 Design House Weddings LOVES glitz and glamour. 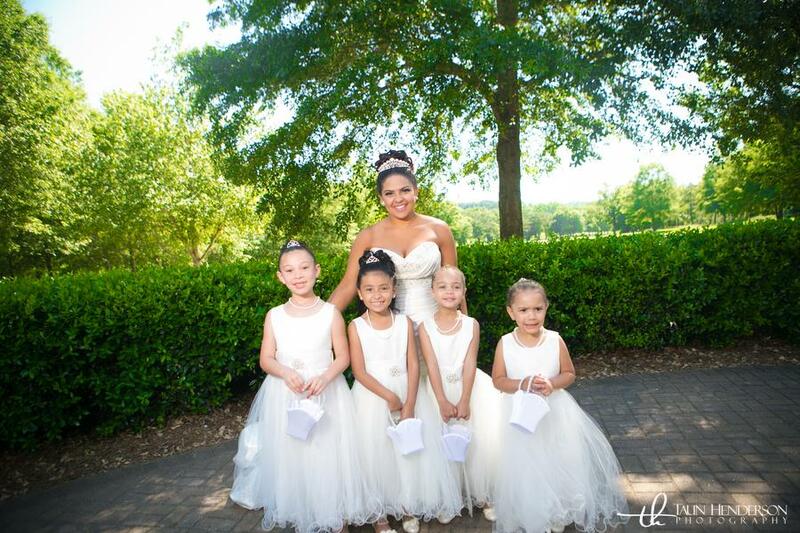 This was a beautiful day for a wedding, and it’s always an honor to fulfill our brides’ wishes. 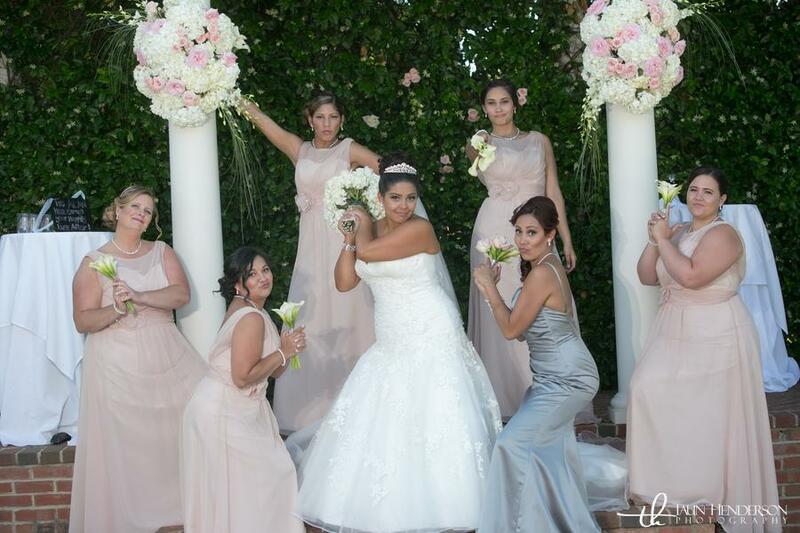 We’re so happy for Vanessa and Alan! 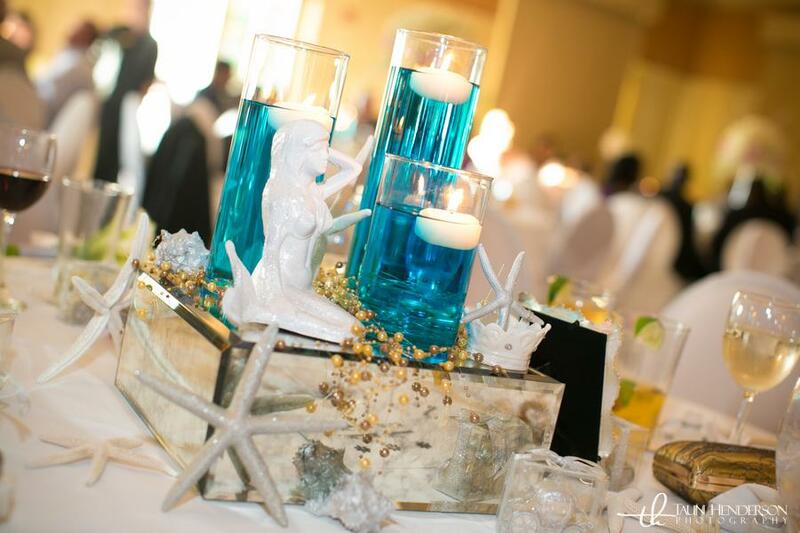 Thank you to Taun Henderson Photography for these amazing photos! 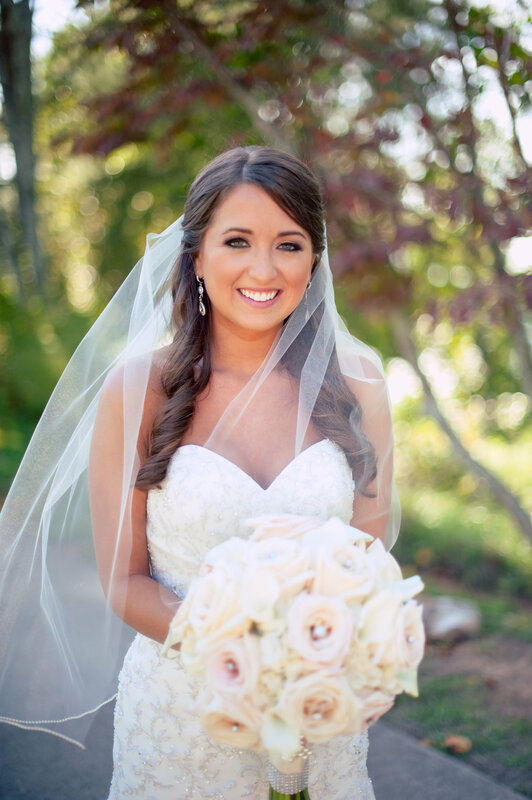 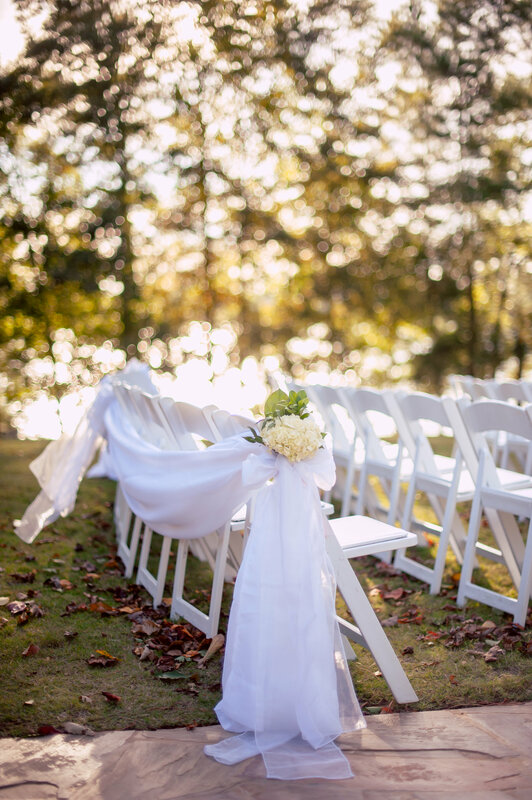 Congratulations to Hannah and Michael who married on a perfect Fall day at Lake Lanier Islands Resort, Legacy Pointe. 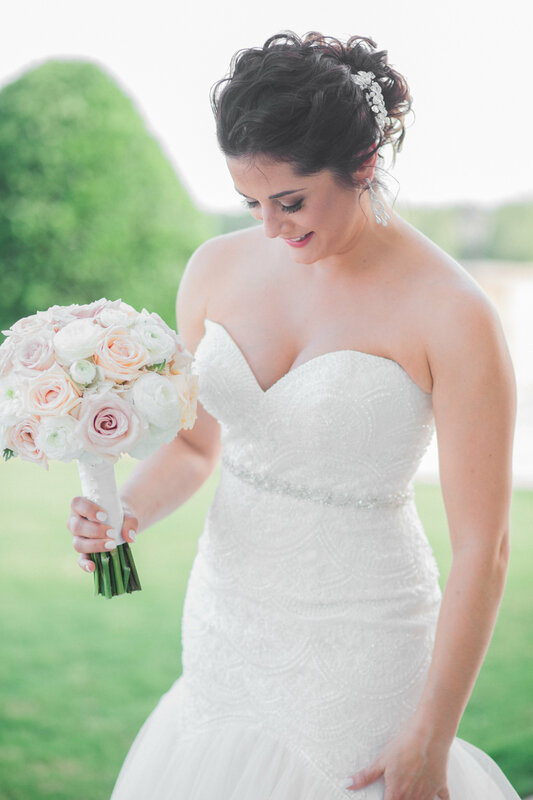 Hannah looked absolutely stunning! 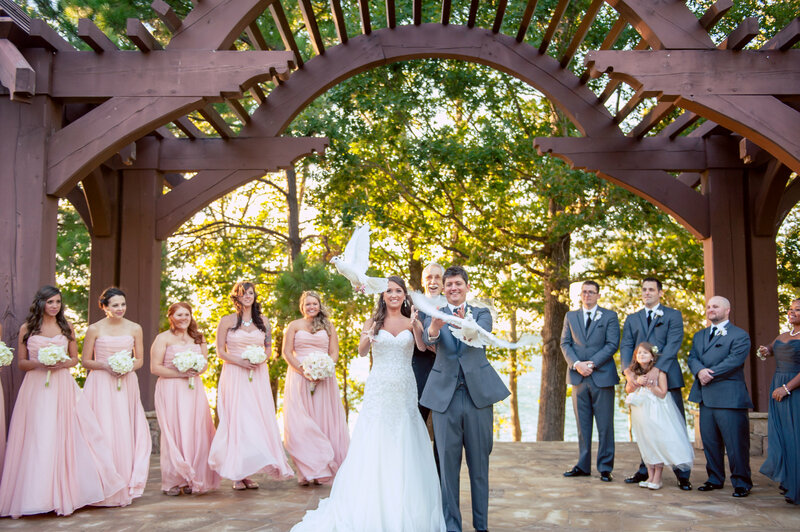 Once the Georgia Doves were released, it was time for the happy couple to celebrate! 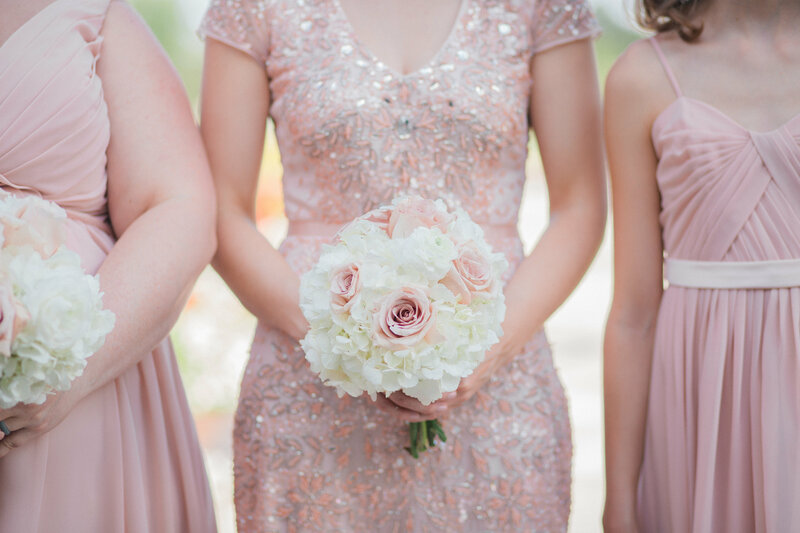 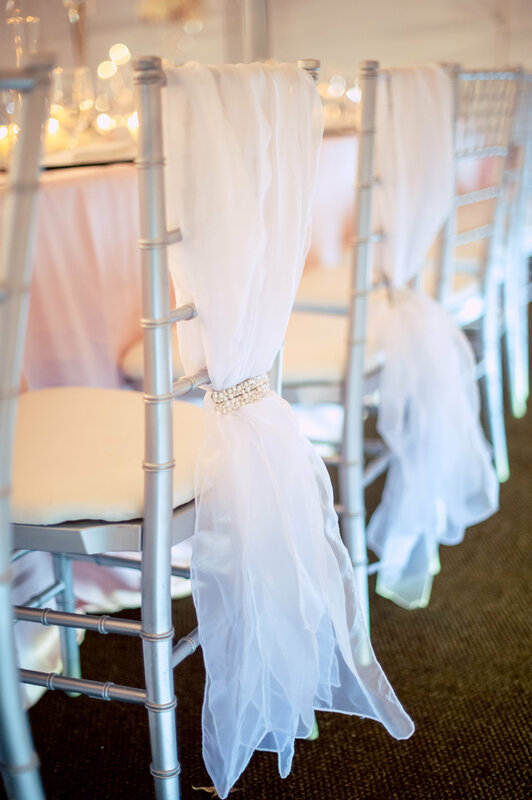 Silver, Blush and BLING! 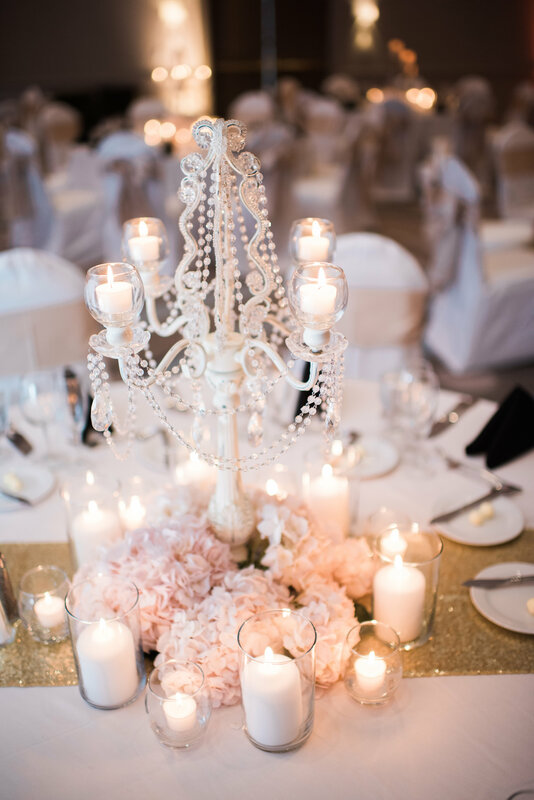 Design House loves sparkly decor. 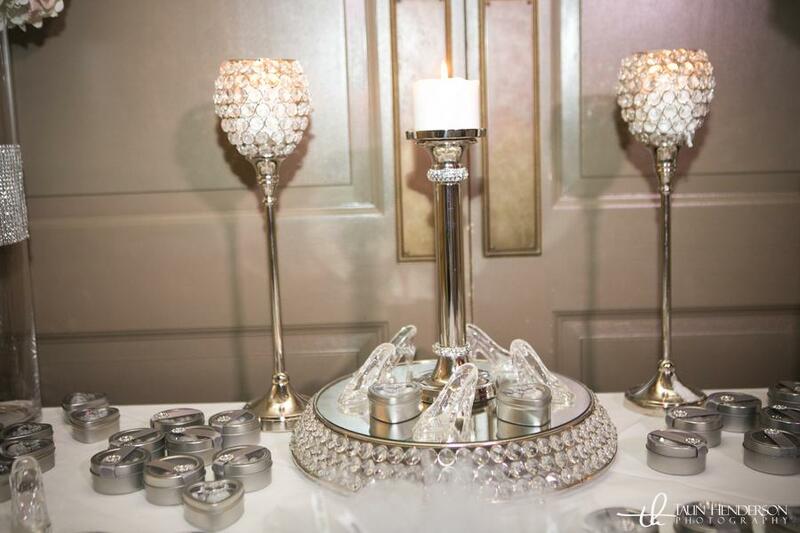 The estate table was an amazing trio of bling wrapped halo vases with loose crystals and floating candles. 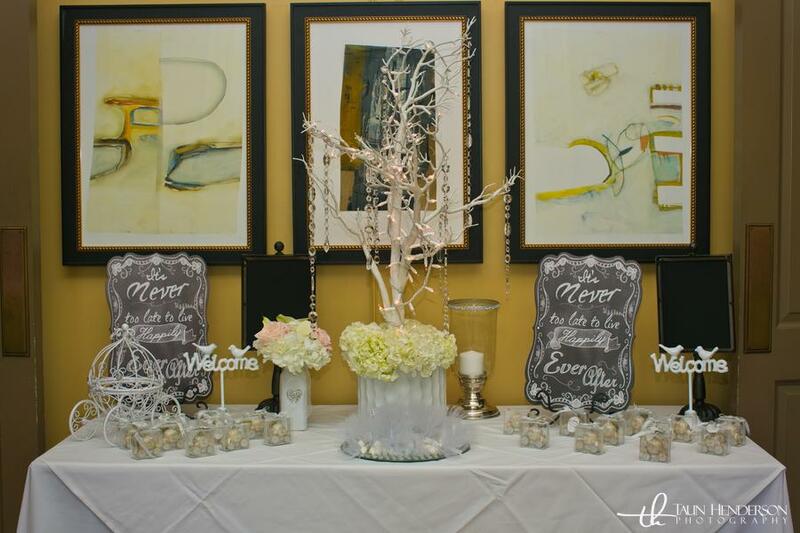 Ivory hydrangeas and silver votives surrounded the decor. 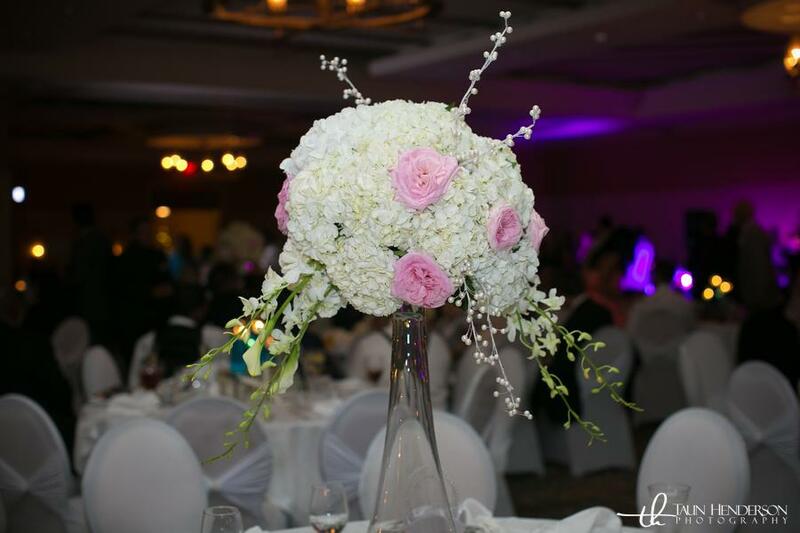 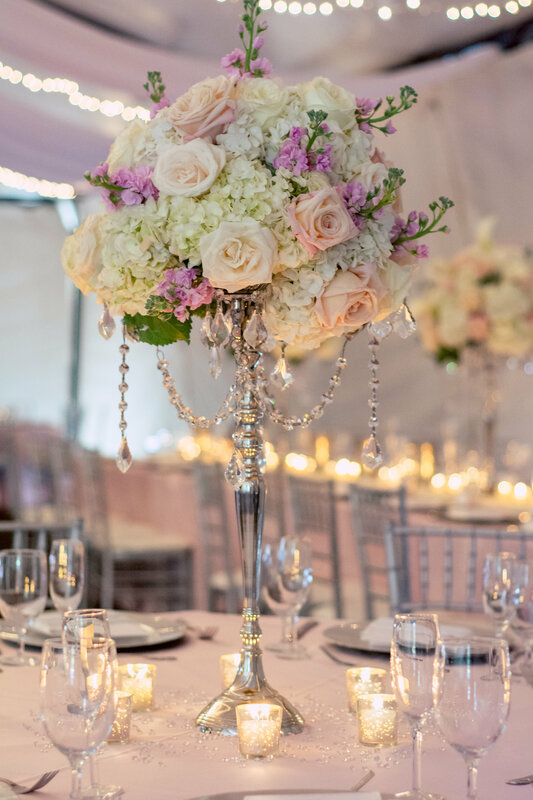 We also designed guest tables with tall silver candelabra floral arrangements filled with calla lilies, blush roses, hydrangeas and hanging crystals. 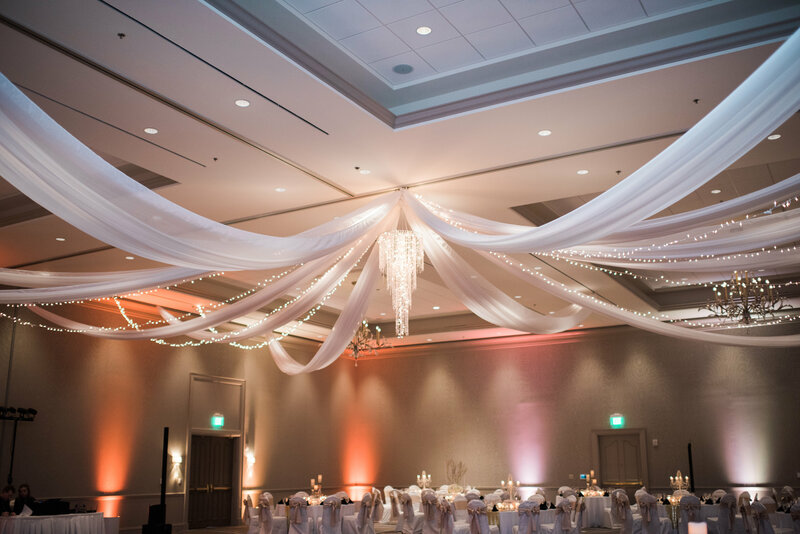 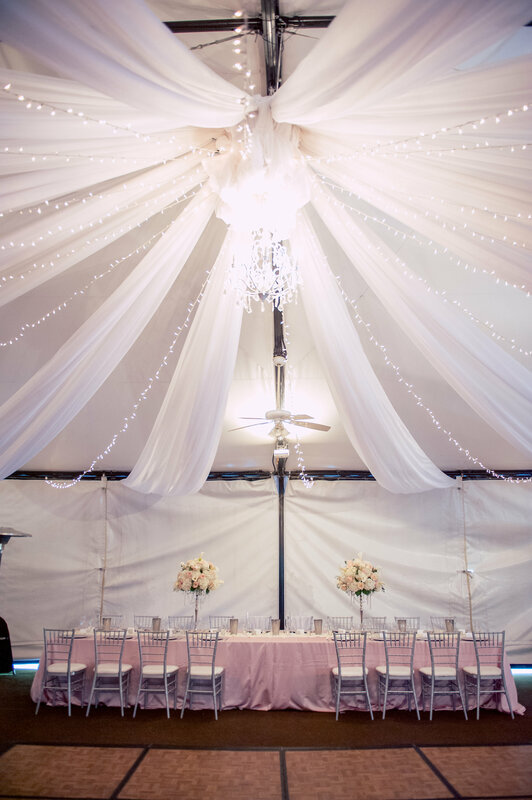 Flowing ceiling drapery with twinkling lights glowed warmly to compliment this memorable evening. 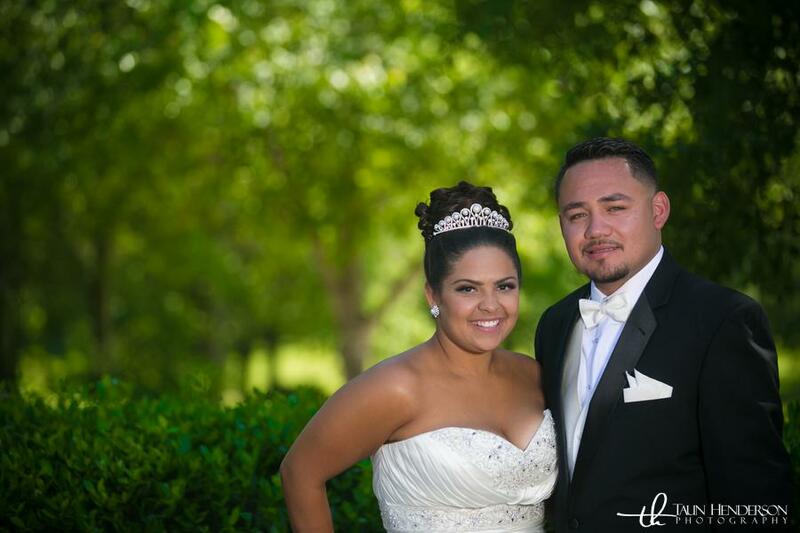 Enjoy these photos by Once Like A Spark Photography.